WASHINGTON (AP) — President Donald Trump's administration appears unbowed by broad domestic and international criticism of his planned import tariffs on steel and aluminum, saying Sunday that the president is not planning on exempting any countries from the stiff duties. Speaking on CNN's "State of the Union," White House trade adviser Peter Navarro said: "At this point in time there's no country exclusions." Trump's announcement Thursday that he would impose tariffs of 25 percent and 10 percent, respectively, on imported steel and aluminum, roiled markets, rankled allies and raised prospects for a trade war. While his rhetoric has been focused on China, the duties will also cover significant imports from Canada, Mexico, South Korea, Japan and the European Union. Addressing criticism of the proposed action, Trump tweeted Sunday that American "Steel and Aluminum industries are dead. Sorry, it's time for a change!" The Pentagon had recommended that Trump only pursue targeted tariffs, so as not to upset American partners abroad. But Commerce Secretary Wilbur Ross said Sunday that was not the direction the president would take. "He's talking about a fairly broad brush," Ross said on ABC's "This Week." He rejected threats of retaliation from American allies as "pretty trivial." Few issues could blur the lines of partisanship in Trump-era Washington. Trade is one of them. 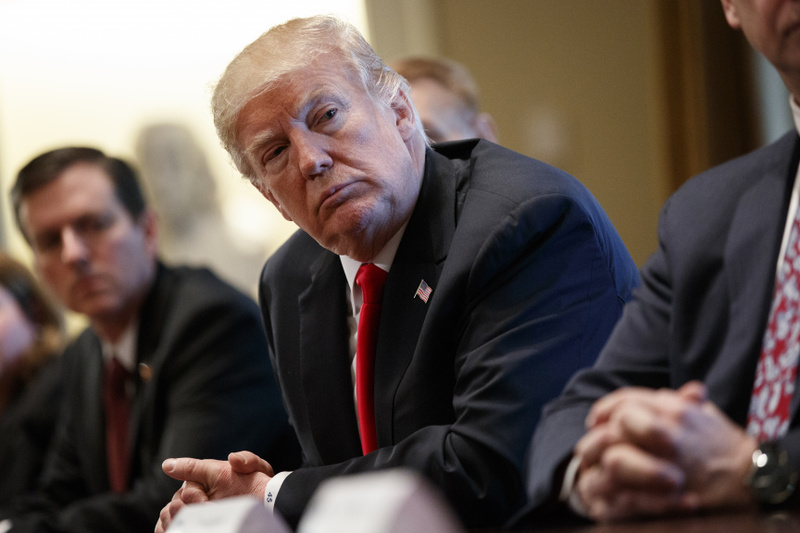 Labor unions and liberal Democrats are in the unusual position of applauding Trump's approach, while Republicans and an array of business groups are warning of dire economic and political consequences if he goes ahead with the tariffs. "Good, finally," said Sen. Sherrod Brown, an Ohio Democrat and progressive as he cheered Trump's move. Sen. Bob Casey of Pennsylvania, a Democrat who has called for Trump to resign, agreed. "I urge the administration to follow through and to take aggressive measures to ensure our workers can compete on a level playing field," Casey tweeted. "This wave of globalization has wiped out totally, totally our middle class," Trump told voters in the hard-hit steel town of Monessen, Pennsylvania, during one of his campaign stops. "It doesn't have to be this way." Trump's criticism of trade agreements and China's trade policies found support with white working-class Americans whose wages had stagnated over the years. Victories in big steel-producing states such as Ohio, Pennsylvania and Indiana demonstrated that his tough trade talk had a receptive audience. Both candidates in a March 13 House election in Pennsylvania have embraced the president's plans for tariffs. They addressed the topic Saturday in a debate that aired on WTAE in Pittsburgh. "For too long, China has been making cheap steel and they've been flooding the market with it. It's not fair and it's not right. So I actually think this is long overdue," said Democratic candidate Conor Lamb. "Unfortunately, many of our competitors around the world have slanted the playing field, and their thumb has been on the scale, and I think President Trump is trying to even that scale back out," said Republican candidate Rick Saccone. But Trump's GOP allies on Capitol Hill have little use for the tariff approach. They argue that other industries that rely on steel and aluminum products will suffer. The cost of new appliances, cars and buildings will rise if the president follows through, they warn, and other nations could retaliate. The end result could erode the president's base of support with rural America and even the blue-collar workers the president says he trying to help. "There is always retaliation, and typically a lot of these countries single out agriculture when they do that. So, we're very concerned," said Sen. John Thune, R-S.D. "This scenario would lead to the exact opposite outcome of the administration's stated objective, which is to protect American jobs," Walker said. The Business Roundtable's Josh Bolten, a chief of staff for President George W. Bush, called on Trump to have "the courage" to step back from his campaign rhetoric on trade. "Sometimes a president needs to, you need to stick to your principles but you also need to recognize in cases where stuff you said in the campaign isn't right and ought to be drawn back," he said on "Fox News Sunday." ''The president needs to have the courage to do that." "It hurts the administration politically because trade wars, protectionism, they lead to higher prices for individual Americans," Phillips said. "It's basically a tax increase." The president wasn't backing down, at least on Twitter, where he posted this message: "Trade wars are good, and easy to win."